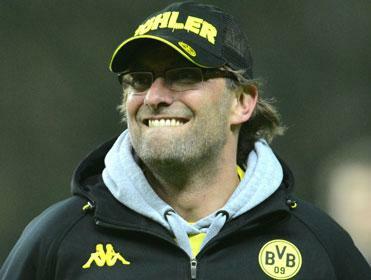 Jurgen Klopp: What's not to like? "As a nickname 'Rolls Reus' is a great riff on Marco's surname, but as a description of his playing style it couldn't be further from the truth. Rolls Royces are big and take a while to get going. Reus, on the other hand, is slight, lightning quick and nimble too." Seven years ago, captain Roman Weidenfeller, midfielder Sebastian Kehl and director of sport Michael Zorc were members of the Dortmund team that risked relegation from the Bundesliga. They all hugged on reaching the Champions League Final, something his girlfriend predicted when the season started. "At the time I just laughed, but now I must say she was absolutely right." When Zorc brought Marcel Schmelzer to Jürgen Klopp's attention, the Dortmund coach looked at the academy graduate and said: "Come on, he's just a kid." Zorc replied: "He can always play." That he can. Only Weidenfeller and Robert Lewandowski have made more appearances than Schmelzer this season. The buzzing left-back scored the winner at home against Real Madrid in the group stages too. Formerly of Bayern Munich's academy, Mats Hummels has become one of the most sought-after and handsome centre-backs in Europe. Excellent at playing accurate long diagonals or bringing the ball out and making raids into midfield, he gives Dortmund's build-up play an unpredictable element. Hummels does have an error in him, though, and is a slight injury doubt for the final with a sprained ankle. When Dortmund won the first of their back-to-back Bundesliga titles in 2011, Subotic went on a road trip around Europe with a couple of mates in a VW camper van. A former US youth international who then committed to Serbia, after the quarter-finals he said: "Our story this season has been like a Hollywood movie, I hope it has a Hollywood ending." The least heralded of Dortmund's Polish contingent, Lukasz Piszczek has emerged as one of the Bundesliga's best right-backs since coach Jürgen Klopp picked him up from relegated Hertha in 2010. Great at surging forward and whipping in crosses from his flank, he has been linked with Arsenal as an upgrade on the declining Bacary Sagna. Signed as the replacement for Nuri Sahin after he left for Real Madrid, Gündoğan struggled at first but by the time his predecessor returned in the spring this year, he'd made the position his own. Hailed as "Dortmund's Xavi" by Kicker, Gündoğan is the tempo-setting metronome in the middle of the park. The Dortmund half of the Bender twins - brother Lars plays for Bayer Leverkusen - if this were a team of cyclists rather than footballers, Sven would be the domestique, the gregario, the water carrier who does a lot of the heavy going, the hard-running. Often clocking more than 12km a game, few cover more ground than him. Unlike Mario Götze, the 'traitor' of the piece for whom he is expected to stand-in after injury ruled him out of the final against future club Bayern Munich, there's no doubting where Kevin Großkreutz's loyalties lie. A 'Dortmund lad', he'd always travel and support the club, standing in the Yellow Wall even when playing for Rott Weiss Ahlen. As a nickname 'Rolls Reus' is a great riff on Marco's surname, but as a description of his playing style it couldn't be further from the truth. Rolls Royces are big and take a while to get going. Reus, on the other hand, is slight, lightning quick and nimble too. His backheel assist for Robert Lewandowski against Malaga was something else. Captain of Poland, Kuba looks older than his 27 years which is perhaps understandable considering what he went through as a kid. Tenacious, he brings the heat, the grit and determination to a baby-faced front four. A modern winger, he'll get past you but you also won't be able get past him. He isn't one for shirking his defensive responsibilities and is arguably as good a right-back as Piszczek. The first player to score four in a semi-final or later since Ferenc Puskas in the 1960 final between Real Madrid and Eintracht Frankfurt, newspapers were full of stories the day after of how everyone from Tottenham and Blackburn to Genoa had almost signed Robert Lewandowski before he went to Dortmund in 2010. Expected to follow Götze to Bayern this summer, he's established himself as one of the best centre-forwards in Europe. Who wouldn't want to play for Jürgen Klopp? True, it's understandable that Götze and Lewandowski find Bayern and the chance to work under Pep Guardiola appealing. "I can't make myself 15cm shorter or start speaking Spanish," Klopp says. What he can do though is make you a great footballer, play exciting stuff and have a lot of fun while you're doing it. The guy's a hero.